To ensure that your flows run as you expect, perform the trigger, and then review the inputs and outputs that each step in your flow generates. Create or update a flow, and then leave the designer open after you select Create flow or Update flow. 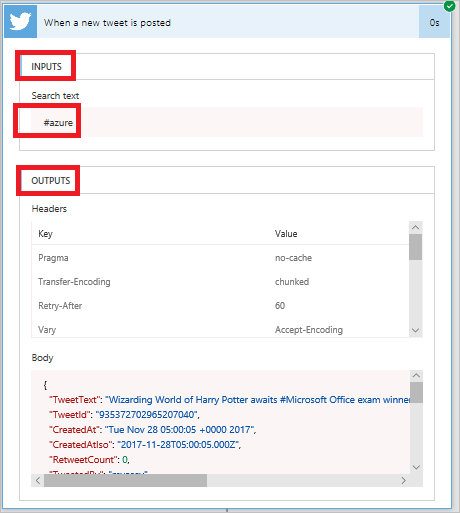 For example, create a flow that sends email whenever someone tweets using the #azure hashtag. Perform the starting action for your flow. For example, send a tweet that contains the #azure hashtag. The starting action and each subsequent step indicates whether it succeeded and how long it took. Select the trigger or action to see its inputs and outputs. Select Edit flow to make more changes or select Done if the flow works as you expect.